Over the past 21 months, my family has participated in a wild ride with health insurance. The experience has been enlightening, incredibly frustrating, annoying, confusing and intimidating. Can I get an Amen! and a witness?!?! In this series on health insurance, I am going to share my experience AND some helpful tips on saving money on health insurance. I need health insurance, but I don’t want to have to take out a small business loan to pay for it! Here are some key ways that I have saved on my health insurance. Increase the deductible By increasing the deductible, I have assumed more personal risk and decreased the risk being carried by the insurance provider. This means that they can offer a much lower premium to me. 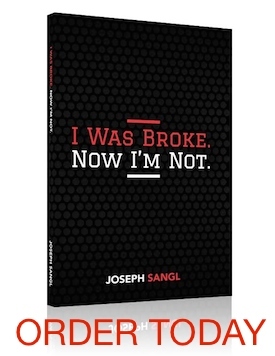 In chapter 12 of my book, I Was Broke. Now I’m Not., I share how I compare insurance policies using the premiums and deductibles to see which one is the best financial decision. Live a healthy lifestyle In a large group health insurance plan, you are automatically admitted to the insurance plan. In an individual plan, you will be accepted/charged according to your personal health history. We can’t control all of our health, but by controlling what we can, we can have a healthier life and better rated insurance premiums. Go to work for an employer with group health insurance coverage If you can not obtain coverage or you have health history that is hurting your ability to obtain affordable insurance, obtain a job that offers group health insurance that does not have a clause that excludes your pre-existing c0nditions. Don’t work, be a complete slob, and live life on the government dole Be broke. Don’t be productive. Save nothing. Go to the hospital and rack up HUGE charges and let all of us tax-paying, law-abiding, hard-working citizens pay it for you.